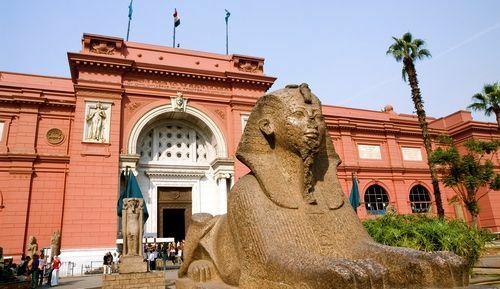 The French Egyptologist, Mariette Pasha, insisted on the construction of a big museum to house the Pharaonic works of art. Twenty years later, the French architect Marcel Dourgnon presented the plan of the Egyptian Museum building situated in the centre of Cairo. 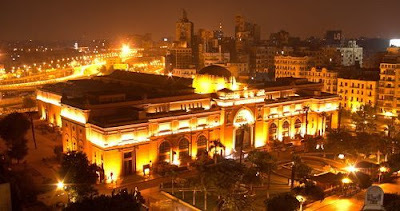 The museum was opened in 1902 and Gasto Maspero was appointed Director. The museum contains a big library and 100 exhibition rooms occupyng two floors. In the museum’s garden, there is a big bronze statue over the marble tomb of Auguste Mariette bearing his name and dates of birth and death (1821-1881). There is also a number of statue’s representing other famous Egyptologists. The most important collection of the museum is that of Tutank- hamun. There are other masterpieces dating from the Ancient Kingdom like the Statues of Cheops, Chepren and Mycerinus. 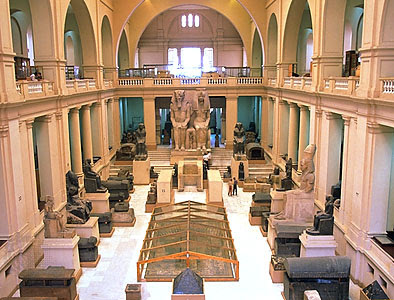 There is also the collection of Thut- mose III, Alhnatoun and a number of statues of Ramses II. Two statues on either side of the gate represent the symbols of the North and the South of Ancient Egypt. One is holding the lotus and the other the papyrus.